The Samsung Galaxy Mega 6.3 and Huawei Ascend Mate both run Android Jelly Bean, but the Mega has the newer 4.2 version over 4.1 for the Mate. Both are heavily skinned, adding many useful features and a few gimmicks to stock Androids. Perhaps the most useful proprietary feature on the Galaxy Mega is Multi-window - it splits the screen in half so that you can use two apps at a time. This is one of those things that makes a big screen worthwhile. 6.3" is big enough to comfortably fit two apps, where both will get about the same surface area as on a 4.5" 16:9 screen, though with a different aspect. Another nice perk of the Mega 6.3 is the widget-enabled lockscreen. That's an Android 4.2 feature, which Samsung fiddled with a bit. Anyway, it gives at a glance info and the DashClock widget has gotten quite popular. It's a shame to leave only a handful of shortcuts on a 6+ inch lockscreen though. Where both custom UIs fail is to leave the beautifully simple Android interface untouched. The latest of TouchWiz has toned down the Eclair-era looks, but it still catches a lot of flak. To be fair, the Huawei Emotion UI won't win many fans over either, despite the ton of preloaded themes that also come with their own icon packs, lockscreen look and so on. TouchWiz may not be very pretty, but it's the most functional and tweakable UI around, the multitude of options in the Settings menu is a little daunting. The quick toggles in the notification area are one example - you can rearrange them, view them all at once and there's a brightness slider (which can be hidden). Emotion UI on the Ascend Mate has toggles too, which can similarly be viewed all at once and rearranged (no brightness slider though). Another win for TouchWiz is that the homescreen can rotate to landscape orientation - a 6+ inch device will often be used horizontally and jumping from a landscape app to a portrait homescreen can be annoying. But it doesn't end here - Emotion UI features a one-level interface like iOS or MIUI. That means there's no app drawer, all apps shortcuts and widgets share the homescreen panes. This can get in the way of arranging widgets just the way you want them as new installs will just shove more and more app shortcuts on the homescreen, even apps you rarely use. Both Samsung and Huawei have decided to include one-handed mode for parts of the UI (the keyboards and keypads), which is great as stretching your thumb might not quite reach the other side of the screen. Huawei has gone a step further and added Easy Panel, which is a floating widget (similar to Facebook's chat heads) that pulls up four shortcuts that launch small apps. This widget can be maneuvered into a comfortable position. Anyway, a custom launcher can eradicate many of the limitations of the default homescreens, so there's a way out if you really don't like what the companies have done to Android. Samsung added only the Smart Stay feature of its Smart Screen suite to the Galaxy Mega 6.3. It's one of the more useful ones - it uses the front-facing camera to periodically check if you're still looking at the device (e.g. reading a long passage) so it doesn't lock or dim the screen. There's also Air View, which allows you to hover your finger over things to get more info or a preview - e.g. the text of an SMS in the Messaging app, the description of an event in S Planner, what's ahead in the timeline of a video, photos inside a folder in the gallery and so on. Where the Huawei Ascend Mate scores a win is the Office department - it comes with a full blown editor, Kingsoft Office, while the Galaxy Mega 6.3 only gets the Polaris Office Viewer for free. The music players on both phablets are quite capable and even support FLAC out of the box, good news for audiophiles. Huawei went with Dolby Mobile sound enhancements, while Samsung stuck to its own SoundAlive tech. We'll check the audio quality of both the Mega 6.3 and the Mate later on. The video players are pretty good too, though the Huawei pulls ahead with better codec support (DivX, DTS and AC3 all worked, while the Mega 6.3 choked on them). The Mega 6.3 does have Pop Up Play that plays the video in a small floating window as you use other apps, but honestly we'd rather see Multi-window support for the video player. 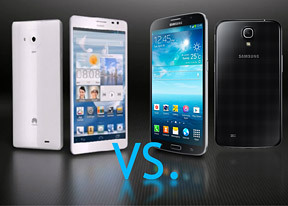 The Samsung Galaxy Mega 6.3 has a leg up on the Huawei Ascend Mate when it comes to connectivity. We mentioned the MHL support in the hardware chapter, but there's more. For one, the Mega 6.3 has a version with LTE connectivity while the Mate is 3G only. However, the Mate has 42Mbps HSDPA while the Mega 6.3 has the slower 21Mbps HSDPA, but the LTE version offers 100Mbps downlink. Anyway, the Galaxy Mega 6.3 also packs NFC connectivity, which is slowly gaining popularity with Android and Windows Phone users. There's also the IR blaster on top, which allows the Samsung phablet to control home equipment like TVs, disc players, air conditioners and such. Group Play might be a gimmick, but it might be fun to try as long as you find a friend with a compatible Galaxy device (there should be plenty of Galaxy S4s around). The same goes for S Beam vs. AirSharing (both have Wi-Fi Direct though). Samsung also includes S Voice on its Galaxy devices, which is an alternative to Google Voice Search with better functionality when it comes to controlling the phone but we prefer Google's solutions (Voice Search and Now) overall. Winner: One-level UIs just don't work very well on Android. Also, the Samsung Galaxy Mega 6.3 runs a newer version of Android at the moment and scores big points for Multi-window and better connectivity. Smaller things like a widget-enabled lockscreen and landscape homescreen also weigh in its favor. The Huawei Ascend Mate hits back with an Office editor and a better video player, but the theming capabilities of the Emotion UI are not enough to fix what ails it. The loudspeaker test was fairly straightforward. Both phablets have a single loudspeaker on the back, nothing fancy, and both scored a Good mark. Given their size, we were hoping for something louder, but you shouldn't have problems hearing the phablets ring. Winner: It's a tie. While the Samsung Galaxy Mega 6.3 posted marginally higher numbers in the individual challenges, it's something we can tell only using specialized equipment, not our ears.